This time last year, the Washington Wizards were sitting at home after falling short of reaching the playoffs. The then-22-year-old Bradley Beal’s rookie contract had expired, and he was ready for a huge payday. Beal believed, with not a single qualm, that he deserved a max contract. And even though there were questions surrounding the durability of the rising star shooting guard (in three of his first four NBA regular seasons, injuries limited him to an average of 58 games a year), Washington inked Beal to a five-year, $128 million max deal. With Beal and a hungry veteran point guard in John Wall, the thought was that almost every team in the league would be looking up to the backcourt the Wizards would boast for years to come. That was until Wall made things interesting. 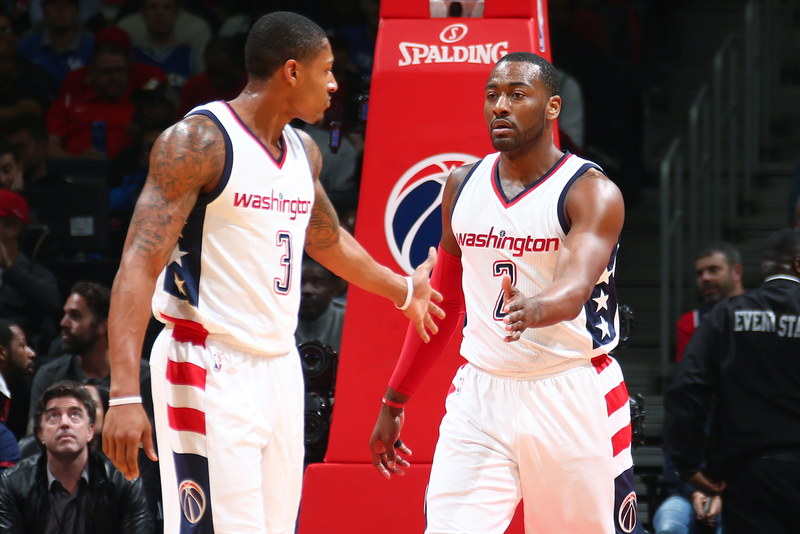 “I think a lot of times we have a tendency to dislike each other on the court …,” Wall told CSN Mid-Atlantic’s Chris Miller in August 2016. Bomb dropped. Maybe it wasn’t quite paradise between Washington’s guard tandem, because, all of a sudden, there was a backcourt beef in D.C. But similar to stupid disagreements between hardheaded siblings, any animosity that Wall and Beal might’ve had was quickly squashed. John Wall (No. 2) and Bradley Beal (No. 3) of the Washington Wizards high-five each other during Game 6 of the Eastern Conference semifinals against the Boston Celtics on May 12 at the Verizon Center in Washington, D.C.
What a difference a year — and winning — makes. Under new head coach Scott Brooks, the Wizards won 49 games during the regular season to earn a No. 4 seed in the Eastern Conference playoffs. Fast-forward to Monday night, and the Wizards fell just shy of an Eastern Conference finals berth in a 115-105 loss to the Boston Celtics in Game 7 of the conference semifinals. Beal had a monstrous Game 7, showing off that young clutch gene with 38 points on 12-for-22 shooting from the floor, and 5-for-10 from beyond the arc, with 12 points in the fourth quarter. And though Wall might’ve disappeared at the end of the closeout game (he went 0-for-11 from the field and 0-for-7 from 3 in the last 19 minutes), he was the one who got the Wizards there, as his game-winning 3-pointer over Avery Bradley in the final seconds of Game 6 was the reason Washington made the trip back to Boston. Golden State Warriors (Stephen Curry/Klay Thompson, through nine games): 43.6 points, 7.6 assists and 8.1 rebounds a game. Cleveland Cavaliers (Kyrie Irving/J.R. Smith through eight games): 30.2 points, 6.6 assists and 4.4 rebounds a game. *Spurs starting point guard Tony Parker suffered a season-ending injury in Game 2 of the Western Conference semifinals. Since the loss of Parker, Murray (two games) and Mills (three) have split time as the team’s starter. In the past eight months, Wall and Beal have returned to being a full-strength “House of Guards” — a nickname the duo received in 2014 in reference to House of Cards, the popular Netflix political drama set in Washington, D.C. Wall had the best season of his career, with some observers calling him the second-best player in the Eastern Conference behind LeBron James. And don’t be surprised if next season Beal makes his first career appearance in the NBA All-Star Game (from which he was snubbed in February). The two guards are now D.C. staples (together, they’re painted in a mural on the side of the city’s iconic Ben’s Chili Bowl restaurant). And they’re built to last, the NBA’s backcourt of the future, should Wall elect to re-sign with the team that drafted him No. 1 overall in 2010 when he becomes an unrestricted free agent after next season.
.@JohnWall and @RealDealBeal23 were terrific this season and really figured out how to be a dominant one-two punch. Their future is bright. Washington’s loss to the Celtics in Game 7 reminded us that the franchise hasn’t advanced to the conference finals since 1979. It also made us believe that the Wizards won’t get back unless Wall and Beal take them there.